cPanel & WHM version 11.44 will introduce a new feature to help you manage configurations for multiple servers quickly and easily. The Configuration Cluster interface in WHM will allow root users to access a configuration cluster, with a master server and one or more additional servers, using their remote access keys. You can then choose to share certain server configuration settings for the master server with other servers in the cluster. 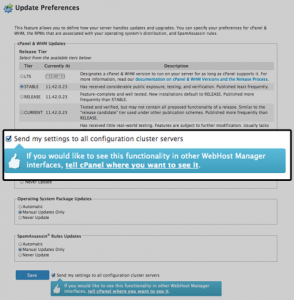 These settings will push to all of the configuration cluster servers whenever you make changes to the master server, saving time and making it easier than ever to add new cPanel & WHM servers. Initially, this feature will only allow you to share settings from WHM’s Update Preferences interface. However, we plan to add configuration cluster integration to more features in the near future. Integrated interfaces will include an option to share settings with configuration cluster servers and will display a confirmation message, indicating success or detailing any issues. 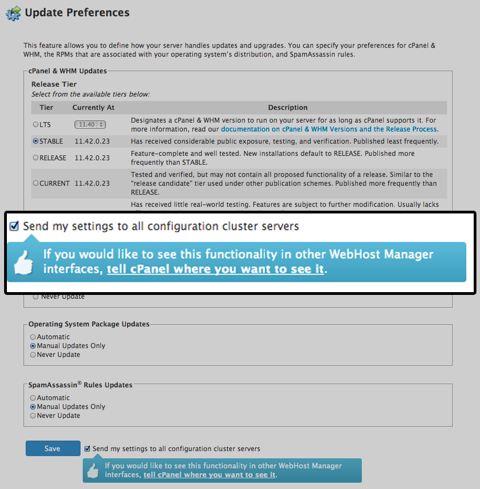 Are there specific cPanel & WHM features that you want to see integrated with the Configuration Cluster feature? Let us know in the comments section below or add your voice to the conversation on our Feature Requests page. You can create a new feature request for the interfaces that you want to see most or vote for feature requests that other users have submitted.